Brink, Jack. "Writing-On-Stone Archaeological Site ". The Canadian Encyclopedia, 04 March 2015, Historica Canada. 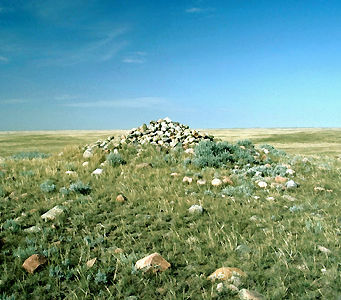 https://www.thecanadianencyclopedia.ca/en/article/writing-on-stone-archaeological-site. Accessed 23 April 2019. Human beings are commonly depicted in the rock art of Writing-On-Stone. Some figures are round-bodied and are believed to be warriors standing behind large shields. Other humans are square-bodied or have hourglass figures and exhibit heart lines and sexual organs. Petroglyphs on the massive sandstone cliffs at Writing-On-Stone Provincial Park (photo by Cliff Wallis, courtesy Cottonwood Consultants Ltd.). From the Blackfoot word Áísínai'pi, meaning "it is written," Writing-On-Stone is both a provincial park and a place of great archaeological significance. Located in south-central Alberta, Writing-On-Stone contains one of the most important collections of ancient rock art found anywhere in North America. 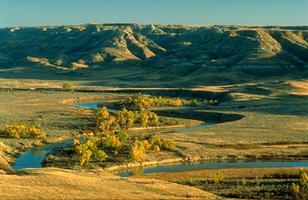 The erosional action of the Milk River has carved an elaborate network of sheer sandstone bedrock walls and exotic column and pillar formations called Hoodoos. It is on these bedrock surfaces that the aboriginal inhabitants of southern Alberta have inscribed thousands of individual images. Although the ancient inhabitants of the Plains (see Native People: Plains) had no written language, they developed a sophisticated form of rock art, or picture writing. Two methods were used to make the ancient images at Writing-On-Stone. In some cases, the soft bedrock was carved or etched to form the outline form of humans, animals, geometric shapes and different artifacts such as bows, arrows and shields. These carved images are called petroglyphs. 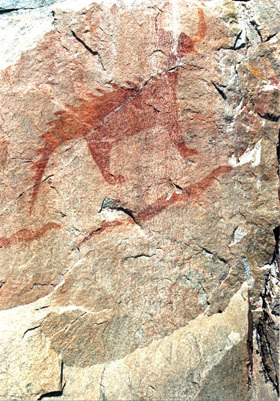 The other method was to paint images onto the rock surface with the ironstone mineral hematite, also called red ochre. 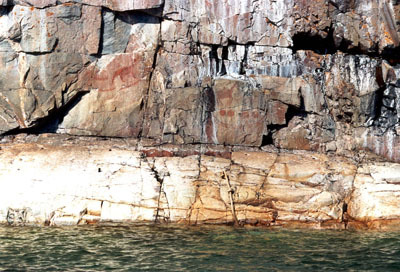 These images are called pictographs. The paint was applied to the rock with fingers or with a brush made from the soft, porous ends of certain buffalo bones (see Pictographs And Petroglyphs). Human beings are commonly depicted in the rock art of Writing-On-Stone. Some figures are round-bodied and are believed to be warriors standing behind large shields. Other humans are square-bodied or have hourglass figures and exhibit heart lines and sexual organs. Animals common to Writing-On-Stone include deer, elk, sheep, skunks, bears, antelope, dogs, snakes and bison. Animals appear by themselves, in groups with other animals and with humans. In some cases, it seems clear that a specific event such as a bison kill or a battle scene is being shown. Horses were often represented; the artists used beautiful sweeping lines to convey their power and speed. While most rock art cannot be directly dated, the presence of horses and other items introduced to Native People by Europeans indicates that some rock art was made in historic times (since about AD 1730). However, many other images appear to be more ancient. 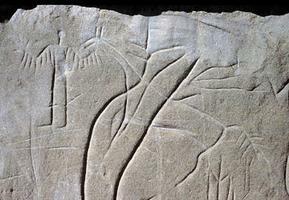 Advances in dating techniques suggest that some scenes at Writing-On-Stone may be thousands of years old. Most rock art can be described as either biographical or ceremonial in nature. Biographical art appears to tell a specific story, such as of a battle or great deed that an individual performed. Some stories feature dozens of individual characters, including people, horses, Tipis, dogs and so forth. The artists of these scenes were likely participants in the events depicted. Ceremonial rock art does not tell a particular story but rather features images of powerful figures and spiritual relationships. Most ceremonial art consists of single or a few characters. This style of rock art appears to represent an attempt to communicate with the spirit world. In historic times, Writing-On-Stone was known as a place where aboriginal people went to find their fortune and to discover their future. Archaeologists believe that the rock art at Writing-On-Stone was made by ancestors of the Blackfoot and possibly other aboriginal groups of the Northern Plains. However, many Blackfoot people believe that the carvings and paintings were created by the spirits. To them, Writing-On-Stone was always a sacred place: a place to be feared and respected, a place to go to only when a person wanted to be in touch with the spirit world. The rock art of Writing-On-Stone Provincial Park is designated as a Provincial Historic Resource and is protected under the authority of the Alberta Historical Resources Act. Public tours of the rock art sites are offered by the staff of the park during the summer months.